This book was provided by Netgalley and Random House UK, Cornerstone in exchange for an honest review. Synopsis: A wealthy woman strangled six hours after she’s arranged her own funeral. This was my first book by Horowitz I read, and I wasn’t crazy about it. It was good at times, thrilling and exciting, but at other times it felt predictable and sometimes a bit easy and simple in the plot. The story was interesting in the way that the author himself was involved in the story. 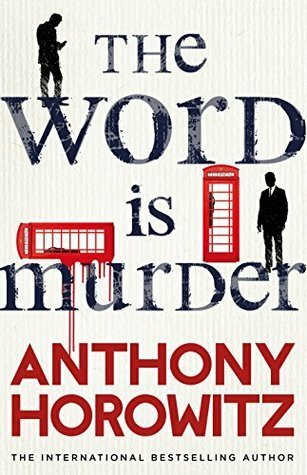 Basically we see this crime through the eyes of Anthony Horowitz himself. We see the process of writing a true crime book and the troubles with finding a way to make it a good book. The best part of the book was after the midsection of the book. The story got a nice pace then and the plot came together more. Secrets were revealed and little hints were given. I flew through that part of the book. The beginning of the book wasn’t slow, but didn’t capture my interest for a while. We got a bit of the murder, but also the story of Horowitz and his writing of the book. I found the part about Horowitz talking about writing the book and his side projects not so interesting. It sometimes came over as a a way to show off everything he gets to do in life. Meeting Spielberg and tv shows he gets to write for. The end of the book felt too much. For me, the book felt like a mix between fiction and reality. Suddenly we got a whole action ‘plottwist’ with the classic getting-captured-and-almost-die scene. It felt too easy for me and didn’t really fit in the way the book was written. The whole murder story felt predictable to me. Even though I didn’t know everything that was going on and didn’t see every hint, I didn’t feel very surprised about the way the solving of the murder was going. The WOW-moment just wasn’t there. I did like how the whole story about the twins got together eventually. The story became more of a whole with the revealing of the twins’ story, which felt like the right time because the story felt like it was getting stuck before that and the author didn’t know what to do. Some of the characters in this book were interesting. I found the detective an interesting man, though a bit obvious. Mysterious, surprising life interests, family issues etc. Looks like he doesn’t care, but does. There also were some characters that felt unnecessary. For me it immediately felt like those were the characters to get you sidetracked and to mislead you . I gave this book 3/5 stars. I was hoping a bit more of a book by such a known author. Though I am very grateful I got to review this book.